I need a strong cord for a specific use. It needs to look nice, without drawing attention to itself. This cord will connect three small pieces of wood. I will reveal how they will be used after I finish weaving the cord. I chose 12/6 rug warp for the project, to make this a durable cord. With a band this narrow, the 12/6 cotton is too bulky for weft. I could not pull the selvedges tight. I need a finer weft that will draw the warp ends together and disappear at the selvedges. Black 16/1 linen works beautifully! 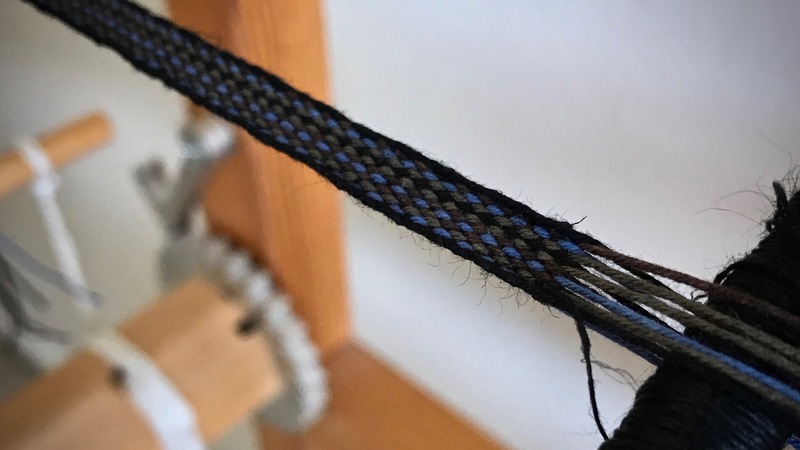 Using 12/6 cotton rug warp for the weft proved to be unworkable for this narrow band. Light shows through the gaps at the selvedges. 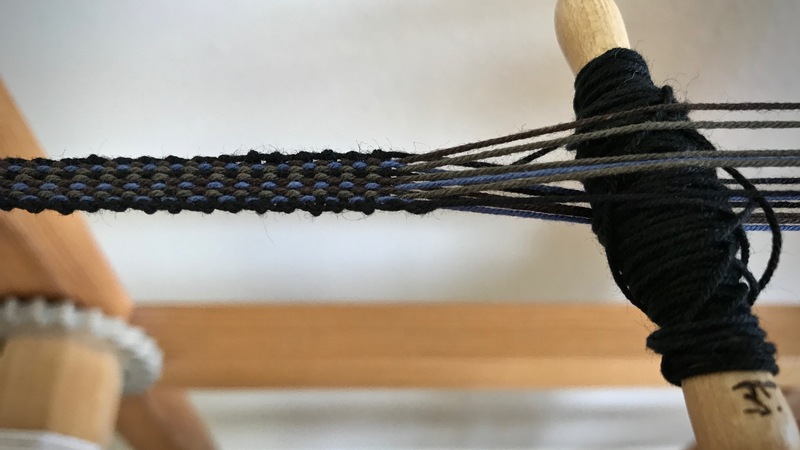 Black linen weft matches the black selvedge threads. 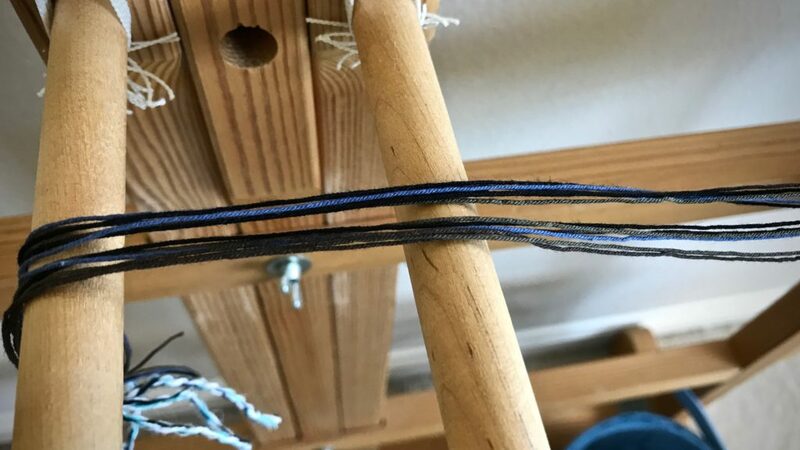 The 16/1 linen enables tight and even selvedges for this 5/16″ (8 mm) band. A change of heart changes everything. The condition of our heart is revealed in the way we behave toward others. Our thoughts and actions are a matter of the heart. To live in a manner that is unselfish, generous, kind, and content, we must do more than line up the right outward appearances. We must start with humility. Having the perfect warp means nothing if the weft interferes with a beautiful outcome. Humility, like the linen weft, is a posture of the heart that pulls everything else together. May your heart be beautiful. I can’t guess what the wooden pieces are for. 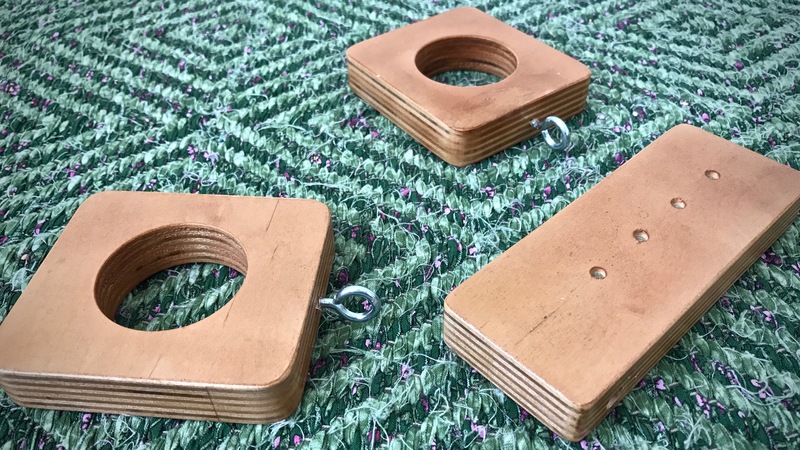 They remind me of several times when I purchased a used loom from someone, and there were several wooden or metal pieces that came with it that neither they nor I knew what they were for. I am glad you know what these are for, and I am looking forward to finding out! Hi Lynette, Yes, you will see… These pieces have a unique and very specific purpose.